Mona Island, often referred to as the Galápagos of the Caribbean, is undoubtedly Puerto Rico’s wildest frontier and one of the last true secret adventures in the Caribbean. Its distant location has contributed to the evolution of its unique biodiversity and geology, boasting massive caves that blend into the colossal limestone cliffs sinking deep into the blue ocean. The island is a sanctuary for marine birds and sea turtles, rivaled only by few on the Western Hemisphere. It was once the home of Taíno Indians and later saw conquistadors and pirates come ashore seeking shelter, and fresh water. 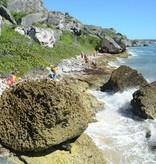 Acampa Nature Adventures is the official tour operator to visit Mona Island Reserve. We are offering small-group all inclusive interpretative camping excursions to Mona Island. You will enjoy a unique guided excursion full of adventure, backed by the impeccable reputation of Acampa, the adventure industry leader in Puerto Rico. The island's remoteness and natural beauty make it the perfect place to explore its secluded surroundings, wander through its caves and photograph the island’s stunning landscape and wildlife. You will have time to admire the old lighthouse, learn about legendary pirate tales, view the best sunset, gaze the stars from the cliff tops, relax, and much more! All of this while camping on a beach under the palm trees and savoring an exquisite culinary offering on a remote pradise. Two weeks prior to departure we will have an orientation and safety meeting at Acampa store to meet everyone and discuss the necessary details, rules, and what to expect during the trip. 45 mile voyage across the infamous Mona Passage, arriving just before sunrise at Playa Pájaros. The trip lasts anywhere from 3-4 hours aboard a 42-foot vessel aptly named "Torpedo". The boat will remain on the island with us for the whole trip. These nightly camping permits are required by the Department of Natural and Environmental Resources. Acampa will provide all camping gear, including 2-person tents, hammocks, sleeping pads and camp lights. You are welcome to bring your own equipment if you so desire. All meals will be included and prepared by local Chef Manolo, owner of Cocobana Restaurant in San Juan. Full breakfasts will include an endless coffee pot, as well as fresh fruits, eggs, yogurt, granola, cereal, bread, cheese, cold cuts, milk, and fruit juices. Lunch will vary depending on the days. The first day we will enjoy a fulfilling welcome lunch after setting up base camp. The second day will be a packable to-go lunch, and the third day will be a genuine beach BBQ at Playa Sardinera. Every night we will have a sit down dinner and will relax afterwards, sharing the day's experiences while enjoying everyone's company. Vegan and vegetarian diets will be accomodated to our offerings. To complement the above culinary offerings, there will be local seasonal fruits, a variety of tasty snacks and sweets, wich will always be available. Ice, a highly precious commodity at Mona, will also be at your disposal for your refreshment. With 20 years experience making trips to Mona, our guides will make your trip a unique experience. 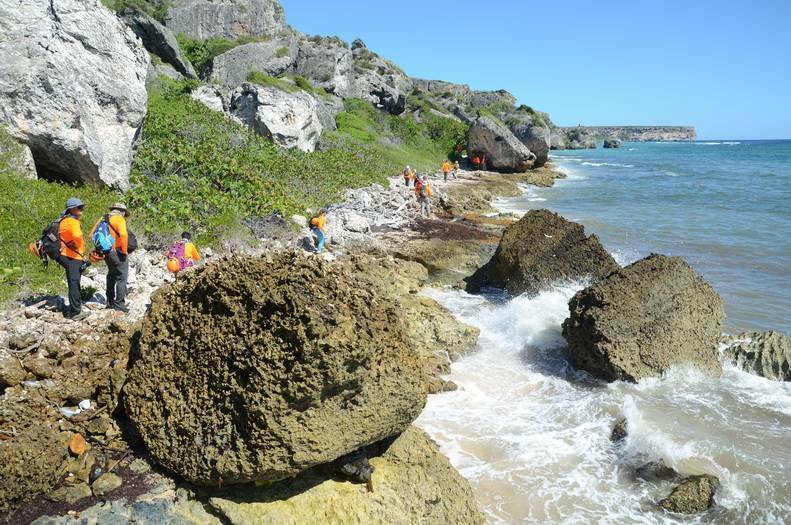 They will share their vast knowledge on various subjects about the island's flora, fauna, geology, and history. They will transmit their love and passion for the island, while guiding you throughout the excursion. Every day on the island we will hike and explore different unique places such as unspoiled beaches, dry forests, massive cliffs and majestic caves. Among them there will be 3 cave systems, the old lighthouse, and the two main beaches of Pájaros and Sardinera and their surroundings. Shorter walks to nearby secret spots around base camp will also happen everyday. On the third day, we will take a sightseeing boat ride to Playa Sardinera at the western side of the island where we will spend the day relaxing, bbqing, and exploring the beach and its surroundings with optional short hikes to nearby landmarks. Bring your best camera and be prepared to return back home with an amazing collection of incredible images that will impress your friends. A professional outdoor photographer will help and teach you about the best spots, techniques and tricks of the trade. Post-trip private dinner and gathering at Chef Manolo's restaurant where we will share our images, videos, and stories with everyone on board. To read our Trip Advisor Reviews please CLICK HERE! Rafa Espasas is an environmental attorney with a devout fascination for Mona. Previously, he worked as a high school teacher for the Puerto Rico Department of Education. His knowledge on environmental issues, and his love for teaching, make him a great expedition leader. With over 50 expeditions under his belt in the last 20 years, Rafa is one of the most experienced "Moneros" around. Raymond Sepúlveda is a passionate outdoorsman, "Monero" and leader in the ecotourism industry in Puerto Rico. Owner and founder of Acampa Nature Adventures since 1997, and has been visiting Mona since then, when he became fascinated with its magic, flora, fauna, and history. That is why he knows the hidden gems of the island, the best routes, and how to experience the island in the most adventurous and spiritual way. 4- August (first week) - "La Cobada"
You should be in good health and physically fit to participate in this adventure. You know your physical abilities. Please do not participate if you suspect that your health could be at risk for any reason or if you could aggravate a pre-existing condition of any kind. You cannot participate in this adventure if you suffer from any cardiac condition, respiratory ailment, weak legs, epileptic seizures, under influence of drugs or alcohol and pregnant.